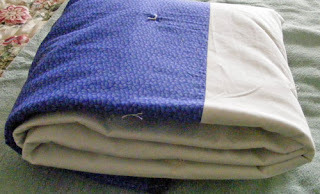 Every time I finish one of these 60" x 80" quilts and fold it up, I hold it close to me and feel good. I feel good because I've made something that will go to someone who really needs it. Lutheran World Relief (LWR) has been collecting quilts and sending them to people in need all over the world for many years. These quilts often end up with men, women and children who have lost everything due to war or natural causes. Many didn't have anything to use for warmth or shelter to begin with. The church I used to attend makes and collects quilts. I'm embarrased to say, this year I only made 2. A couple of years ago I made 15! It depends on the fabric I have available and time of course. I used fabric donated by a friend to make the ones this year and still have a few pieces left. I've just run out of time before collection. So right now I'm committing myself to make at least 6 next year. I'd better start looking for fabric sales. There are also some more fabrics in my own stash that I really don't need. There are definitely people who need them more than I do.